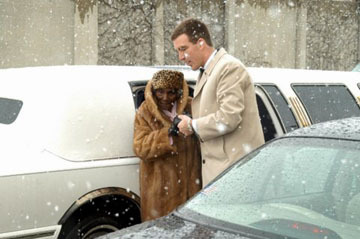 On March 12, 2005, Mary Crosby Chappelle passes an historic milestone-her 100th birthday. This year Ms. Chappell's birthday occurs during a very significant celebration for African Americans in Buffalo, the Niagara Movement Centennial. Ms. Chappelle's birth was during its inauguration 100 years ago. And later in her life, because of her community activism, she crossed paths with and celebrated the lives of some of the luminaries of the Niagara Movement, e.g., W.E.B.B. Dubois, Reverend Jesse Nash, Sr., A.J. Smitherman, and others. It is indeed an exciting time to be in Buffalo and to celebrate this momentous Centennial within the Centennial-the 100th birthday of Mary Lee Crosby Chappelle. To the woman called by so many names such as; Sage of the Ages, Maryle, Our Mary, A Great Lady, Precious Jewel, An Aristocrat, Brilliant Diamond, and so many, many more, we salute you! 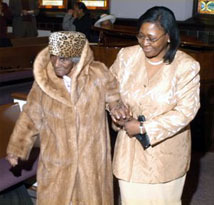 On Saturday, March 12, 2005, Uncrowned Queens celebrated the 100th birthday of Mary Crosby Chappelle at Bethel A.M.E. Church. Mary Crosby Chappelle arrives at Bethel A.M.E. Church for her Centennial Celebration. Mrs. Chappelle is escorted by her granddaughter. 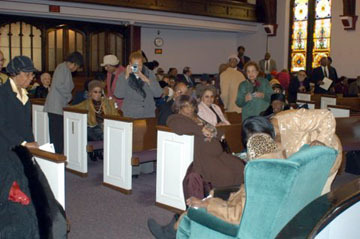 Mrs. Chappelle was seated on a "throne" at Bethel A.M.E. Church during the celebration.